These are my helpers which is truly aiding me to keep my resolutions in my mind. 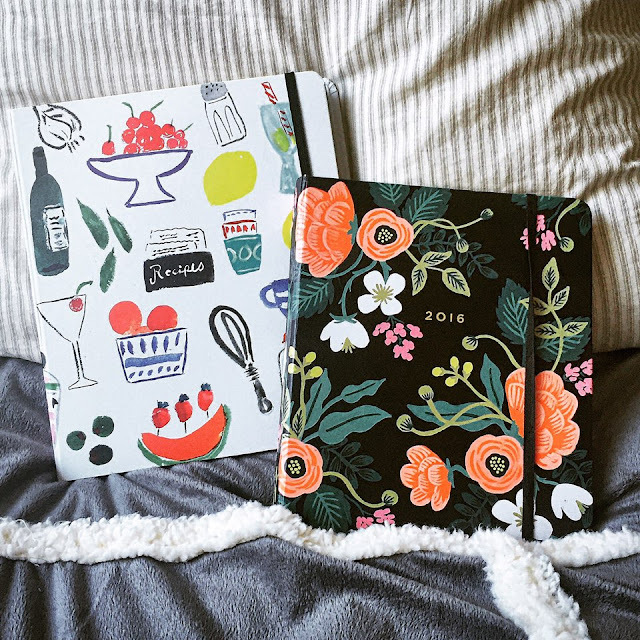 One is a recipe book from +kate spade new york and the other is a planner from +RIFLE PAPER Co. They are super cute and cool. If you are my friend, you will probably know how terrible I am at cooking. Sadly, I can see my self as a gourmet. I never eat I do not like. So, most of my dishes I cooked go to a trashcan so many times. Last holidays my brother visited Montreal to see me. Also to travel around. He said to me, "Seriously, why do you cook? Please stop cooking. I think it`d better to eat out". LOOOL I replied, "Because it is too expensive to eat out!! I want to save my money". Then he knocked me down with, "You are NOW wasting your money. You buy tones of foods and you throw them away!!" My brother was right. In fact, I did not cook that much before my brother came because I had same idea on my mind. But I cooked for him because he was my brother and he visited here to see me! But that was not good. Sorry oppa. My bad. However, new year came! I have been wanting to improve my cooking skills and dreaming to publish my own recipe book one day. Obviously for anti-cooking-selves like me. So, I am working very well with the recipe book. I think my dream will hopefully come true so far. 'Hopefully'. I bought this because the cover was so pretty and I really liked the way it featured. Just in case you wonder I put this specs below. Happy Tuesday and See You Very Soon!